“The DEATH Of The USS THRESHER” The Story Behind History’s Deadliest Submarine Disaster. By Norman Polmar. Commissioned August 3, 1961, USS Thresher (SSN-593) was the lead boat in her new class. At the time the 3,700-ton nuclear submarine was the most advanced ever built—specifically designed to hunt and kill Soviet subs. With Lieutenant Commander John W. Harvey, USN, in command, Thresher departed Portsmouth on the morning of April 10, 1963. In company with USS Skylark (ASR-20) Thresher was scheduled to undergo a series of test dives about 220 miles east of Boston, Massachusetts. She submerged at about 0745, reporting back to Skylark every fifteen minutes. All went well for the first hour, but at 0902 Thresher reported: “Experiencing minor difficulties. Have positive angle. Am attempting to blow. Will keep you informed.” A few minutes later, the radio operator aboard Skylark heard a series of final eerie sounds; that of the submarine breaking up and compartments collapsing—Thresher was gone! Dropping far beneath her hull crush depth, the sub had suddenly imploded, killing all 129 men—it was the first U.S. nuclear submarine loss in history. The gruesome remains of Thresher were eventually located in 8,400 feet of water, where the pressure exceeds 1,000 pounds per square inch. In “The Death of the USS Thresher,” renowned naval and intelligence consultant Norman Polmar recounts the dramatic circumstances surrounding the loss of Thresher. 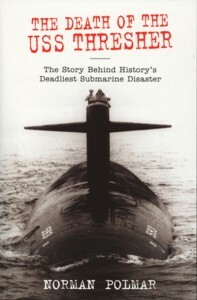 This 2004 revised edition of Polmar’s 1964 classic is based on interviews with Thresher’s first commanding officer, other submarine officers, and the designers of the sub. Polmar provides recently declassified information about the Thresher, and relates the loss to subsequent U.S. and Soviet nuclear submarine sinking’s, as well as to the escape and rescue systems developed by the Navy in the aftermath of the disaster. “The Death of the USS Thresher” is a must-read for the legions of fans who enjoyed the late Peter Maas’s New York Times best-seller “The Terrible Hours.” New softbound book, 194 pages, 31 black and white photographs, 5 diagrams, a complete Thresher crew roster, no index. Norman Polmar has been a consultant to senior officials of the U.S. Navy and Department of Defense, and was a member of the Secretary of the Navy’s Research Advisory Committee (NRAC). For four years—as an employee of the Northrop Corporation—he worked on the Navy’s program to develop submarine escape and rescue systems. He is the author of more than thirty books on naval, aviation, and intelligence subjects. Polmar lives in Alexandria, Virginia.